Meri is a real, multi-talented Psychic Medium, Police Psychic, & Energy Healer, who Provides PROOF of ACCURACY & In-Depth Consultations! Get FREE & DISCOUNT MINUTES ~ Just Call NOW & Ask! X01272. PING for chat! 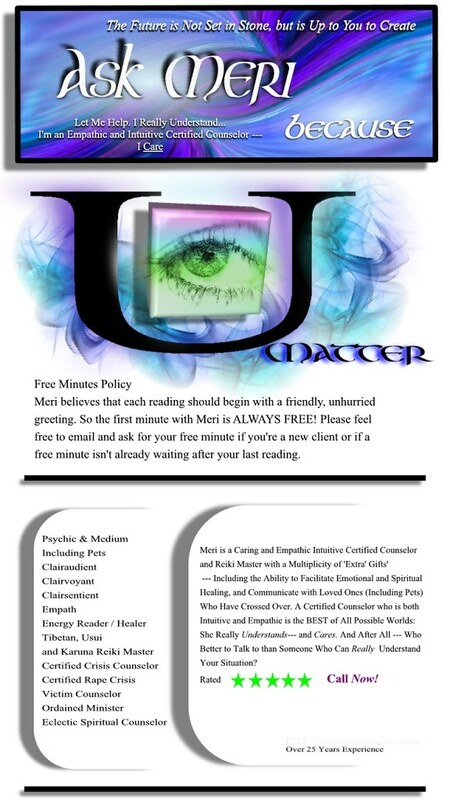 Meri is a real, multi-talented professional Psychic Medium, Police Psychic, Animal Communicator, & Energy Healer. She is also an Eclectic Intuitive Certified Counselor and an Ordained Minister with over 25 years experience serving thousands of clients worldwide. She accurately reads people and animals, living and in spirit, remotely, and provides PROOF of ACCURACY in the first minutes of each call. A Certified Counselor who is Both Intuitive and Empathic is the BEST of All Possible Worlds: She Really Understands -- and Cares. And After All, Who Better to Talk to than Someone Who Can Really Understand Your Situation? Meri accurately reads people and animals, living and in spirit, remotely, and provides PROOF of ACCURACY in the first minutes of each call. ...to provide you with several pieces of identifying information about the person that you can verify as accurate, as proof of genuine psychic ability. Meri will then reconnect to get you the information you need. Please be patient as the information can be received in many forms: feelings come through in Empathy, images through Clairvoyance, etc., and making sense of it all and then translating all of those impressions into language so that you can understand them can take a second or two for each of your questions -- especially if the information is particularly complex and multi-layered, and received piecemeal in multiple forms, using multiple gifts. New to Meri? Get your first 5 minutes for 20% off with a FREE Minute NOW! Call and ask about my New Client Special Offer! Returning Clients: Get 20% Off with a FREE Minute on the first 5 minutes of Every Call! Call and ask about my Returning Client Special Offer! Meri does receive some precognitive information, especially after becoming familiar with a client's energy and focus, which she usually expresses in terms of probabilities, or likelihoods. But, in part due to the future being in flux until it becomes realized as the here and now, it is not an absolutely reliable talent (in anyone). You can understand this by imagining yourself at a river delta where it divides into many streams and rivulets as it pours into a larger body of water. Behind you is the single river of the past. In front of you the many possible ways you may choose to travel as you move into the sea of your future. Look up "multiverse theory" for a much lengthier explanation. In short, if you're looking for that, "You'll meet a tall, gorgeous stranger" carnival fortuneteller experience, you'll have to find it somewhere else: Meri won't feed you a line just to keep you on the phone and coming back for more. What she will do, in the warm, caring, kind, and humorous manner of a good spiritual intuitive guide, is to provide you the information you seek, comfortably, in a way that is easy for you to take in, digest, and grow with on your own unique path. If Meri is unavailable or busy, please arrange a callback or make an appointment. If you are unable to get through using the call button and Meri appears to be available, call her at: 1-800-ASK-KEEN, Ext. 01272. PING Meri for chat! Wow.... reiterated word for word a sentence I had said on how I felt which validated connection. No fluff and stuff. Wow! !my ex called me as I was finishing my call with Meri... as Meri was telling me I’d hear from her soon. Can’t believe it..thank you for your insight! Amazing! Connected quickly, spoke honestly and is very kind. Very straight and to the point. Thank you! Returning Clients: Get 10% Off with a FREE Minute on the first 10 minutes of Every Call! Call and ask about my Returning Client Special Offer! Question You Have and to Be a Full Participant in Your Spiritual or other Reading. Meri is one of three TOP advisors on this site. I have consulted her many times and she is truthful, accurate, and kind. She needs NO info and never asks anything but first name and last initial, (maybe dob, but not usually) and KNOWS EVERYTHING. The thing I love about her particularly is the depth and complexity of her readings. TEN STARS!! CALL HER, you will never regret it! Meri is, quite simply, one of the most gifted psychics living. I am a professional "psychic to the stars" and she's MY go-to psychic. She is completely accurate. I don't even SAY things like that. She is so funny and adorable and modest that it isn't 'til after you get off the phone with her, that you realize..."Wait a minute, everything she just said was completely spot-on!" And then a month later, you realize that, everything she said would happen, HAPPENED. She is positive, brilliant and, well...just The Real Deal. And she should charge about ten times more than she does, so get her NOW before she figures that out. What an Excellent Reading!!!!! She is intuitive and her reading is insightful, precise and informative. She is a very nice and wonderful lady and I enjoyed talking to her. Thank you so much and will be calling you back. Meri gave me a great reading... She is honest but compassionate: talking to her is like talking to a best friend. Accurate and very friendly, and can give you unique and verifiable information very early on in the reading. I would definitely choose her again and would recommend her to anyone! ***** More!!! I have had some gifted psychics, but never one that left me totally speechless!! I can't believe she is not charging 20 times more! I would pay that and more!! I thank you with all my heart. Love and light to you and yours. A very kind person, with perceptions. I have the distinct feeling that she really cares. After our call was cut off, she emailed to make sure I got information from her that she felt was critical. Very helpful. Will definitely call her again. Thanks Meri! Great reading! Excellent and exact details. --After I hung up with you, all was confirmed. Absolutely amazing. It was 2a.m. ET but my query was confirmed! Will call you again. Thanks! Meri was very lovely and professional. I mentioned I had questions about my current relationship and she picked up right away some of the key issues and concerns. She helped me confirm some of my "gut" feelings about the situation. Also, she was honest. When she couldn't quite get a read on a couple other situations in my life she was upfront about it. Definitely, I would call her again. Meri is highly gifted and truly knows what she is talking about. She can truly tune into energy and read you. She uses light to guide you on your path. Try her out she is very talented! It Helps Others to Know What a Reading with Me is Like. Get your first 5 minutes for 20% off with a FREE Minute NOW! Call and ask about my New Client Special Offer! *Meri reserves the right to modify or discontinue Special Offers and Discounts at any time, without notice. and Date of birth or Current [approximate] age. (regarding yourself) First name and date of birth. and takes less than 30 seconds. And then you will be given the opportunity to continue with a regular price reading. Copyright � 2001-2017 Advisor Meri, All Rights Reserved. normally during the first few minutes of each call. (or for technical or carrier issues, over which I have no influence). I am happy to give referrals. Psychic Medium BFF -- Meri has been a user of Keen since 2003. Getting Spiritual Readings advice from Psychic Medium BFF -- Meri through www.keen.com is safe, secure and confidential.